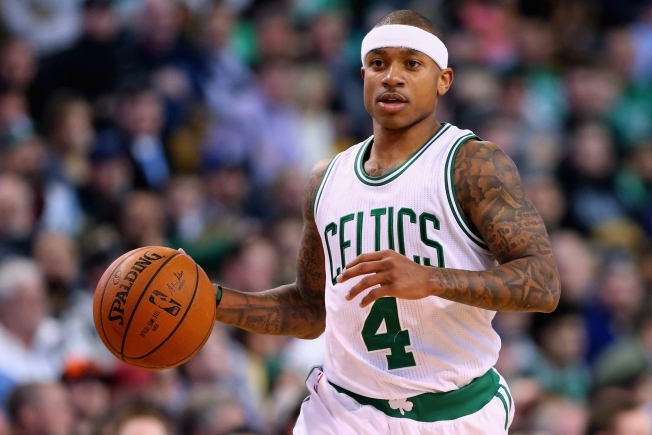 The idea that the 2016-2017 Boston Celtics are a better team without Isaiah Thomas is absolutely ridiculous. There, I said it, and it feels even better writing it down (or typing it). The fact that the subject was brought up on talk radio over the last week doesn't surprise me. If you don't believe me, here's my Twitter post from Dec. 7. It's an easy take. I get it. It's December, and if you're talking basketball, breaking down the pick and roll or how to play good team defense doesn't exactly keep people interested. This all began after the Celtics beat the Magic by 30 points without IT. This was an Orlando team that was 10-12 at the time and had played the night before in Washington. Those in the "trade Thomas" camp were quickly brought back to earth after the C's lost games against Toronto and Oklahoma City, and they will probably lose again Wednesday night in San Antonio. Here's the thing. The idea of trading Thomas doesnt really get you anywhere. You still have too much talent to tank, and then you're still stuck in no-man's land. You might as well keep your All-Star guard who just happens to be averaging 26 points per game this season. It's not easy to find scoring in this league. Just remember it was only two short years ago that Jeff Green led the team in scoring. Yikes. I'm not saying Isaiah is going to bring Boston back to championship glory, but what I am saying is leave the little guy alone. Spare me the talk that Boston would be better without him. Craig Kolodny is a sports producer at NBC Boston/necn. You can follow him on Twitter at @NBCBostonCraig.